Chicken Kiev has a disputed origin, though you need to trust that in no way does that change the melt-in-your-mouth goodness which comes from the herb butter that is gloriously baked inside. Whether you are craving Russian or Ukrainian cuisine, or you just want to try something new, then this is the simple and elegant recipe to work with. It is a homestyle meal that also serves as a dinner party classic, and it is sure to satisfy the most finicky eaters. While the chicken breast can be pounded flat, filled with cold herbed butter, held together with toothpicks and coated with a gluten-free flour and egg mix, you can save yourself a few minutes of prep time simply by slicing into the chicken breast and creating a pocket to put a generous slice of parsley butter. Then get onto the business of coating it, frying it until golden brown and tossing it into the oven till it is bursting with creamy butter. 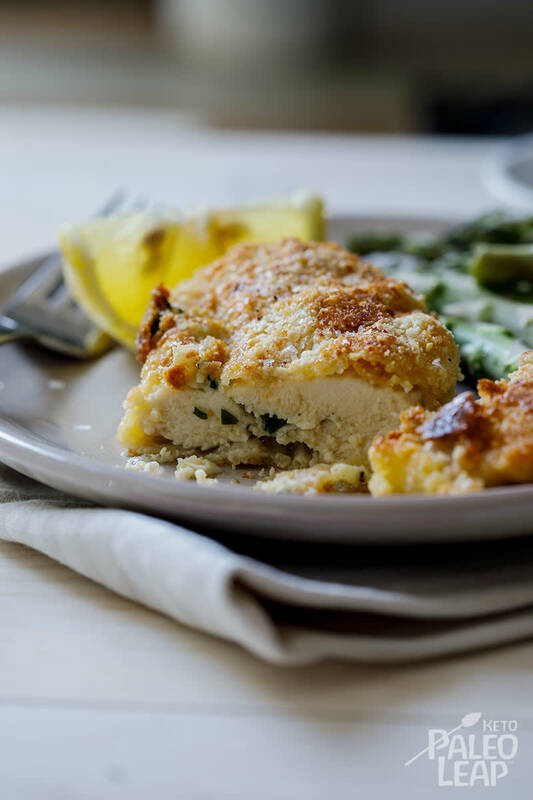 You can use cassava flour to dust the chicken, alternatively coconut flour works just as great – but you can eliminate it altogether to keep the carb count down even lower. If you chose that route go straight ahead to the egg wash and almond flour. With the goal to soak up all the excess butter, you can indulge in creamy mashed cauliflower as the main side, to ensure you get every drop, adding a nutritious serving of sautéed Brussels sprouts with bacon to liven up your plate. Combine all the ingredients for the herb butter in a bowl and mix well. Roll into a sausage-shape in plastic wrap and refrigerate until firm. Slice a slit into each chicken breast, taking care not to slice through the breast as you create a pocket. Stuff with a slice of the flavored butter. Place the cassava flour, eggs, and almonds each in separate bowls. Season cassava and almonds to taste with salt and pepper. Coat the chicken by dipping it first in the cassava flour, then in the egg and finally in the almonds. Fry in a medium-hot frying pan in cooking oil until golden brown on each side, then place into the oven and allow to bake for 20 minutes or until the chicken is cooked through.